Oramo und sein wunderschönes Orchester lassen Kokkonens Musik ebenso transparent wie effektvoll aufleuchten, so dass der Hörer einen wirklichen und spannenden Einblick in diese spröde und doch immer fasinierende Musik erhält. For Finnish conductor, Sakari Oramo, a man with a yen for reviving neglected composers, Joonas Kokkonen is an important figure. He's the 'missing link' between the great Jan Sibelius and a new generation of Finnish composers such as Magnus Lindberg. Oramo gets playing of real bite and energy (...). It was the works Joonas Kokkonen composed in the early 1960s that established his international reputation and made him one of the most significant composers Finland produced in the decades after the second world war. As with its superb predecessor, this disc offers outstanding performance. Joonas Kokkonen is considered "Finland's most significant composer after Sibelius" (American Record Guide). However, he still awaits discovery among many lovers of accessible contemporary music. 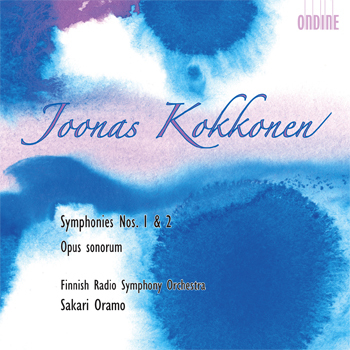 Sakari Oramo and the Finnish Radio Symphony Orchestra, unrivaled champions of Finnish late 20th-century music, have taken up this task with a complete Kokkonen symphonies cycle: The benchmark first volume (ODE 1098-2) was unanimously hailed by the press as a "must-have disc". On this new release, they perform the first two symphonies, coupled with Opus sonorum for orchestra. Written in the years following Sibelius's death in 1957, these masterpieces reveal Kokkonen's affinity with the music of J.S. Bach and his full exploration of expressive tonal colours.